Evidence suggests that calcium from whole-food sources may produce more favorable effects in bone health than isolated calcium supplements. Similar to most nutrients, the body can utilize calcium much more effectively when it is paired with its natural co-factors such as magnesium and other trace minerals. New Chapter® is proud to deliver a calcium complex derived from whole food that delivers these key essential nutrients in their safest, most active form within the infinite complexity of whole food. 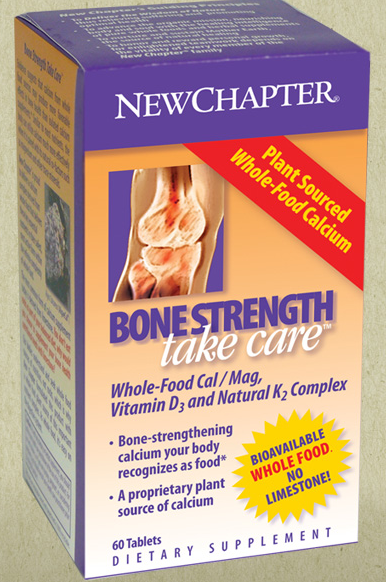 In addition to the whole-food source of calcium and magnesium, we have also added other bone-nourishing nutrients to complete the food complex. Vitamin K is an essential co-factor in calcium absorption and retention. Human cell proteins that don’t get enough vitamin K can’t hold onto calcium, causing this critical nutrient to drift away from the bone. Lack of calcium in the bones makes them porous and brittle. Excess calcium in blood vessel walls impede blood flow. Bone Strength Take Care® contains MenaQ7™, the most bioavailable, bioactive, and longest-lasting form of vitamin K available. MenaQ7™ is a patent-pending form of vitamin K2 extracted from natto and has been clinically shown to promote bone health. The complex is completed by vitamin D3, which has been found to aid in bone support and function in several studies. New Chapter® creates whole-food complexed vitamin D3 by culturing the nutrient with probiotics and organic whole foods. Magnesium and trace minerals like silica, vanadium, and strontium have also been shown to promote bone health. It is helpful to think of a “bricks and mortar” analogy. Calcium serves as the “bricks,” while nutrients like vitamin K, vitamin D and trace minerals serve as the mortar. Without both “bricks” and “mortar,” a strong physical structure, i.e. healthy bone, cannot be achieved. I have used this stuff very long and take them every day. I am grateful for this product because it very significant to my health and made a remarkable difference for me. My joint pain is now completely recovered and this product will help me to maintain the strength of my bones. I experience it that it’s secure with no side effect and the best way to get mineral & calcium. I will be continuously use it for good support for joints and bones.